Have you ever wondered how much forklift propane your fleet needs or if your forklift is getting the right amount of mileage out of a tank of propane? 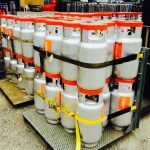 We’re going to try to take some of the mystery out of estimating your forklift propane needs so you’re never left with less supply than you need. Most forklifts use 8 gallon tanks of forklift propane. This size tank should last for about 8 hours on a four-cylinder engine. Bigger engines will, of course, burn through fuel faster. The same 8 gallon tank will run out in perhaps, 6 hours or maybe even 4 hours if it’s an 8-cylinder engine. One way to extend your runtime on bigger engines like that is to buy bigger, 10-gallon tanks. Anything that causes the machine to lift more, like double load carriers, will cause it to use more fuel. It’s doing more work so it makes sense that the machine will run through more forklift propane. Poor Maintenance. Just like a car engine, a forklift engine that isn’t maintained or tuned up regularly can burn through more fuel. Higher than average fuel consumption could be a sign that there’s an engine problem starting and warrants a call to a service tech for a check-up. Unusual usage. If the forklift is regularly being pushed to its’ max speed, used to travel long distances, and left idling for long periods of time, it will burn through fuel faster. Again, just like with a gas-powered engine, turning off the machine when not in use and eliminating unnecessary trips can save fuel. 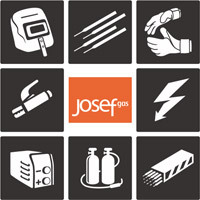 If you need help estimating your forklift propane needs or are looking for a new supplier in the Toronto area, give Josef Gas a call. We supply propane for many kinds of forklifts and have our own on-site propane tank for local fill-ups and quick delivery. Call 416.658.1212 or contact us online to discuss your needs or feel free to stop in and visit us in person at 201 Basaltic Road, Concord, ON L4K 1G4.